Posted by Kearsten Chapman on August 19, 2016 at 10:35 AM. 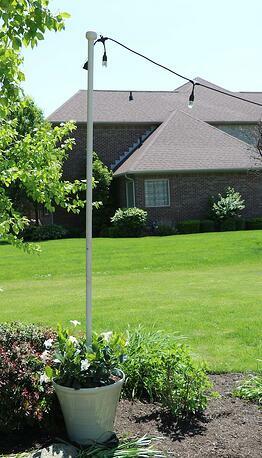 Filed under LED Lighting, How To, Around the Home, News . Whether it's a quiet moment relaxing on the patio or a backyard get-together with friends and family, there is something about the soft glow of cafe lights that transforms the entire atmosphere of any occasion. 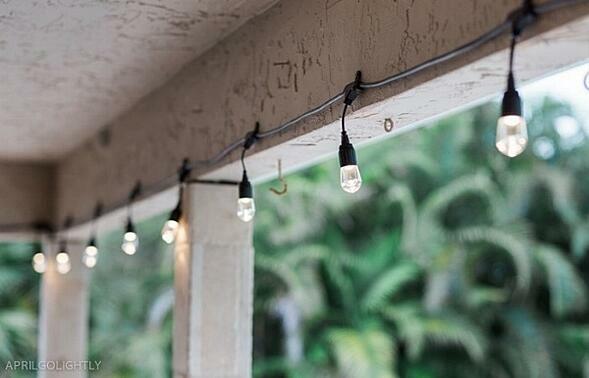 The decorating possibilities are endless when it comes to hanging outdoor string lights on decks and patios. With a variety of sizes and options for lighting designs, cafe lights are the perfect way to quickly re-energize and enhance backyard areas to match your personal style and complement your space. We recently partnered with some savvy DIY-ers and challenged them to unleash their imaginations and show us their creative ideas for dressing up their outdoor spaces with Enbrighten Cafe String Lights. 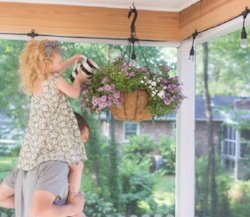 Get inspired with these DIY projects and be sure to share your ideas with us for creating your own backyard bliss or perfect patio with cafe lights on Facebook, Twitter or Instagram! 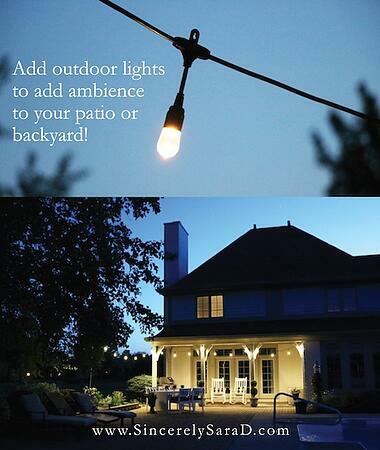 Sara added ambiance to her patio by hanging cafe lights along her back porch area. 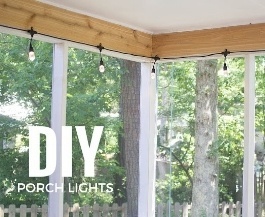 What really sets off this look is the DIY planter light pole she created to have the lights extend out and above the patio table. She used simple materials like an 8 ft. dowel rod, outdoor paint, a flower pot, concrete, gravel, a hook and potting soil to create a portable light pole that she can move around her patio area and change up the look. She also connected her lights to a GE Bluetooth Outdoor Smart Switch so she can control the lights from her phone using the free Avi-on app. Check out her video and see how fun and easy it was for her! Sometimes the simplest patterns work best when hanging cafe lights. With flexible mounting options, you can create a sweeping effect with cafe lights or mount them to a flat surface for elegant straight lines like Ashley did in the top two photos above. April showed us how cafe lights can make a great gift! She not only helped her parents upgrade their patio (bottom picture), but also helped them be able to spend more time doing what they love and enjoying evenings relaxing on the back patio. 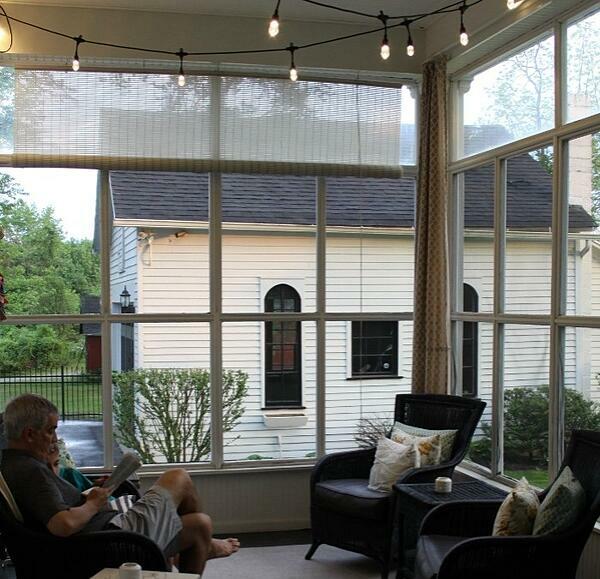 Susan spruced up her screened-in back porch by hanging cafe lights in a zig-zag pattern directly above a seating area where they spend most of their time. 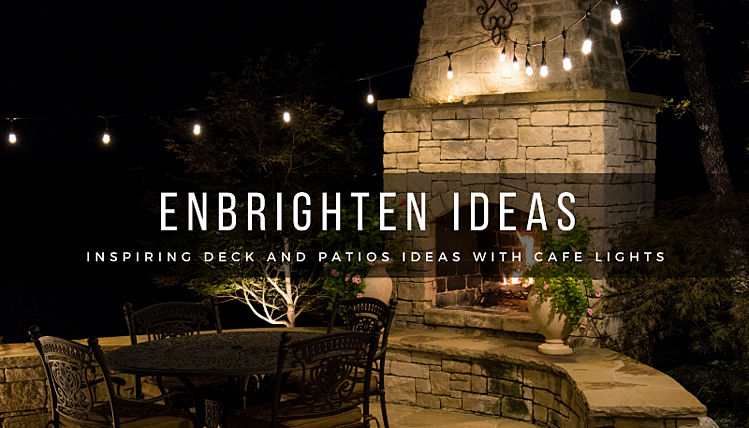 Café lights are a great way to improve outdoor areas like decks and pergolas, especially since they are rated for permanent year-round use, but Susan proves they can add just as much charm and ambiance to screened-in porches as well. We love the look of this cozy farmhouse space and love how even during the day they still look great glowing. 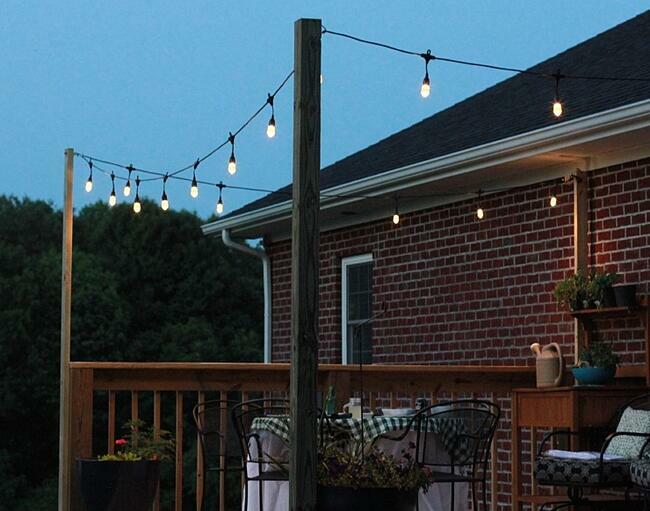 Jessica helped her deck come alive by hanging cafe lights in a scalloped square design around her deck. She added permanent posts around the deck and used simple screw-in hooks to attach the light strings to the posts. 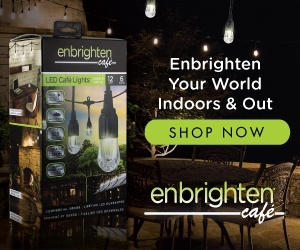 "Enbrighten Café Lights by Jasco make our back porch usable late into the night. It isn’t uncommon that you’ll see us sitting out there long after the sun sets," said Jessica. "The project was relatively inexpensive and will provide years of use for entertaining our family and friends. We love our new outdoor space." 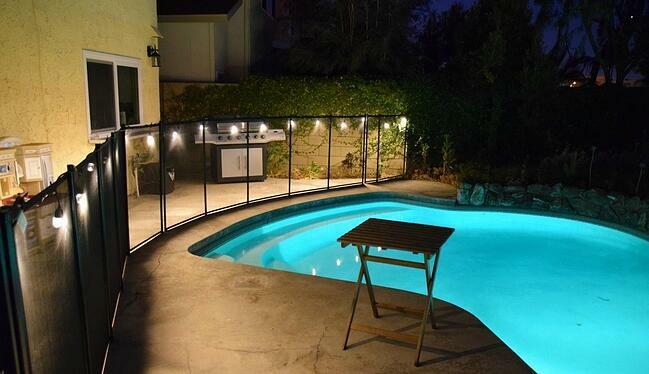 Brittany wanted to add ambiance to her backyard's atmosphere and brighten the area around her pool at the same time. The charming look of the classic Edison-style lights was the answer to achieving the appearance she wanted and the shatter-resistant/weather-resistant acrylic bulbs offered the durability she needed for a safe and secure option. You don't have to go far to have fun and relax with the family outdoors. If your family likes to spend a lot of time outside, but you're limited on patio space, consider creating an extended hangout space like Marlynn did in her Portland backyard. She wanted to do something different with her outdoor space and used cafe lights to help breathe new life into her backyard. 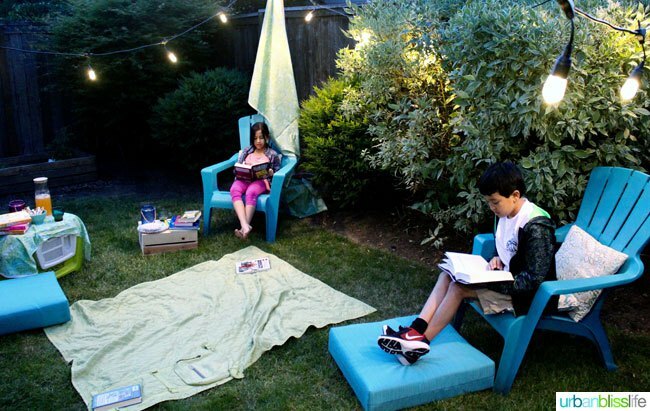 Key elements to her cozy outdoor hangout included comfy blankets and pillows, mixed seating for a festive vibe, a cooler, small tables with study bases for the lawn and of course the RIGHT lighting to help illuminate this fun new outdoor family space. Whether your home has a large deck in the countryside or a small urban patio, cafe lights can instantly spruce up any space and transform a backyard area into a lively setting for entertaining, dining and relaxing from day to night.